Bartis Dale Knight, 94, passed away at his home on Thursday, March 10, 2016. Bartis was born on August 16, 1921 to Sam and Lillie Mae (Wade) Knight on the Cook Ranch. He attended school in Content. He joined the Army Air Corp in 1942. Bartis served until 1946, first as a supply clerk, then as military police, and finished his tour of duty as an airplane and engine mechanic in Brazil. His next assignment in the Air Corp was in China flying over "The Hump", the war came to an end before he shipped out to China. He returned home from the war February 22, 1946 when his aircraft crash landed in Florida. 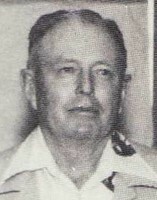 Bartis never left southern Taylor County except for his tour of duty in the Army, upon his return to the states he met then married Alline Davis on November 20, 1948 in Brownwood. They welcomed three children Belinda, Carrolyn, and Reba. He was a farmer and rancher first and a part time pumper in the oil field. He served on the Jim Ned School board and the Farm Bureau board. He was a member of the Lions Club. 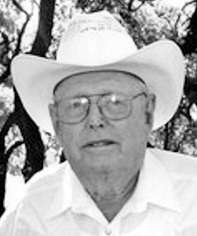 Bartis is survived by his daughters, Belinda Hammes and husband Tim of Camp Verde, AZ, Carrolyn Hudson and husband Gene of Lawn, and Reba Denson and husband Jack of Abilene; sisters, Geraldine Farmer of Pearland, and LaVerne Mitchell and husband Buzzy of Nederland; grandchildren, Kennon Hammes of San Antonio, Keith Hammes and wife Sarah of Camp Verda, AZ, Chad Hudson of Lawn, Shawn Hudson and fiance Alexis Anderson of Denton, Kyle Hudson of Lawn, Ryder Coughlin and wife Stephanie of Merdian, Kaylee Miller and husband Garrett of Lawn, Caleb Coughlin of Abilene, Kevin Coughlin of Austin. Great grandchildren, Hallie, Kye, and Lillian. He was preceded in death by his wife Alline Knight (December 1993), parents Sam and Lillie Knight, grandson Cory Hudson, and sister Delta Berner. A funeral service is scheduled on Tuesday, March 15, 2016 at Lawn Baptist Church at 2:00 P.M. His burial will follow at the Dewey Cemetery. The funeral will be officiated by Marcy Grun, Pastor of Bluff Creek Cowboy Church. The funeral is directed by Fry-Smith Funeral Home, of Tuscola. A visitation will be held on Monday, March 14, from 5:00 P.M-7:00 P.M at the funeral home.